Often times, rushing into installing the unit can result in serious damage to your OPENUPS2 board or computer. Always double check the polarity of your wires with a voltmeter. Always double check the polarity of the batteries before introducing into the UPS device. Improper configuration leads to system damage!!! Use batteries from same lot, same age with same resting voltage for best results. 14.2.1 The first main screen is the "Status"
14.2.2 The second main screen is the "Settings"
The openUPS2 was designed to provide user specified regulated power output from a wide input voltage, battery backup, LiFePO4 (18650 size) battery charging and cell balancing in a single PCBA. Battery cells are integrated in the device, no need for special cabling between cells and UPS. The UPS contains a synchronous boost Converter with high accuracy voltage and current regulation and automatic system power path selection from adapter or battery. It charges the battery in three phases: preconditioning, constant current/constant voltage mode. The unit can be used as an embedded UPS or as a Portable Energy Pack providing user regulated 12V-24V wherever is needed. Installs itself as a battery in Windows, using the Windows hid driver without any driver installation, visible as an icon in tray bar. Pin1 is marked with red color. 1b) Press the Enter Bootloader button on the configuration software's user interface. 2) Start the HIDBootLoader.exe software provided to flash the new firmware. 3) Press Open new Hex File for LiFePO4 or new Hex File for LiIon . 4) Locate the hex file and open it. 7) After the device reconnects on USB with the configuration software the new firmware version will be displayed in the title bar of the software. NOTE: After changing parameters the device needs to be restarted so the new configuration becomes active. Restart the UPS by pressing the restart button in the user configuration software. It is recommended to disconnect large loads at the output of the UPS before pressing the restart button on the user interface. The UPS can behave differently depending on settings. The OPENUPSMODE parameter sets this behaviour. When using the UPS embedded in a system together with a motherboard the modes 0 and 1 should be used. Connect USB header P3 to the motherboard's internal USB header. USB connection is used to sense the motherboard's ON or OFF state. Connect P6 header's 1 and 3 pins to the motherboard's POWER SW header. (cable provided). Connect P10 header to a push button. This push button completely eliminates the need for any additional buttons to start or stop your system. Mode 0 - when adapter input voltage is present a momentary pulse is sent through P6 header starting your system immediately. Mode 1 - the momentary pulse is not sent and your system will not be started but battery charging is possible just like in a laptop. In this mode the UPS can be a portable energy pack. Shutting down the UPS does not depend on USB connection. With the use of a push button connected to the P10 header you can instantly start and stop the UPS's output when running on battery. Connecting input power will charge the pack just like in any other modes. It also acts as an UPS providing uninterrupted output in this mode. This mode is recommended for powering devices other than motherboards or for portable energy use when working on the field and regulated 12-24V power is needed from batteries. When your system is up and running you can always stop it by pressing again on the push button or by shutting down from the OS(Operating System). In case your system is on battery and under-voltage situation is present it will be automatically shut down. When the system is on battery and it is shut down by OS the UPS can also immediately shut down to preserve battery. This is a configurable feature. When the UPS runs on batteries for a predefined time can initiate a shut down sequence. This is configurable feature. - When the UPS is shutting down it senses the motherboard's state by measuring the +5VUSB signal. If the motherboard was shut down by the OS (+5VUSB is not present) no pulse will be sent. by turning off the UPS's output in order to conserve the battery. 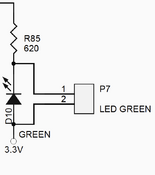 There are two ways of setting the output voltage. 2)If bit0 in UPS_CONFIG is set to '0' the the output value is set by the configuration switch P5 on the back side of the unit. The second method is useful when using the UPS in Mode 2 as a Portable Energy Pack on the field to configure the required output voltage. 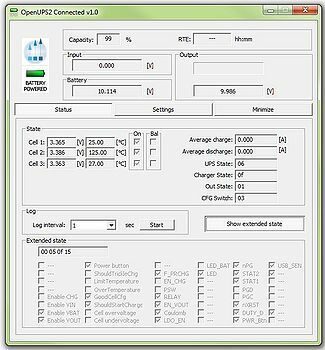 The temperature threshold parameters can be adjusted from software. The configurable parameters are: CHG_TEMP_COLD < CHG_TEMP_COOL < CHG_TEMP_WARM < CHG_TEMP_HOT. 1) Right click on the battery icon from the tray bar then choose power options from the context menu. Alternatively you can choose Power Option also from Control Panel Items. 2) Select/Create a power plan or modify existing ones. Recomended input power supply should provide >=13V and capable of providing at least 1A for charging + the current needed to sustain the required output power. Using a 12V power supply is not recomended for Li-ION since the input would be close to battery voltage or lower and the batteries can't be charged enough and the system will run mostly on batteries. Update the device with Li-Ion version of firmware which includes support for Li-Ion chemistry! Connect a proper input voltage source to the P1 connector. If input voltage is present , the UPS will enable the proper power path and energy will be flowing from input to output and, if necessary, battery charging is started. A gratuitous pulse is sent through P6 to wake up the motherboard depending configured Mode. Each cell is carefully monitored so that in case of an under-voltage or over-voltage event proper actions are taken. The charger is a BUCK converter so in order to charge batteries input voltage should be higher than battery voltage. Unit is in Ship mode consuming less than 1uA. MCU is not powered. Can be waked up by pressing P10 or if input voltage is present. The initial remaining capacity is detected based on an open-circuit voltage based state-of-charge estimation, using the predefined values set by the OCV_SOCxx parameters. Further estimation is based on coulomb counting method which is more precise after a full charge cycle has been performed. The UPS doesn't save the coulomb counter in its internal flash memory when it is shut down. After wakeup the open-circuit voltage based estimation is used again. The power switch on the motherboard(if connected) will be shorted this period to turn the Motherboard ON or OFF. The pushbutton connected on the P10 header must be shorted this period to be considered as pressed. 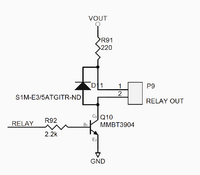 bit0:Enable output voltage settings directly from OUT_VOLTAGE parameter. If disabled output voltage is set by configuration switch on the back side of the PCBA. bit1:Enable Ship mode, consumption is less than 1uA. Unit can be waked up only by input power presence. bit0:Enable Sleep mode, consumption is 530uA. Unit can be waked up by button or input power presence. If input voltage is above this threshold the UPS will start and take power from the input. If Vin is not present and all the battery cells are above this threshold the UPS can start and runs on battery Default is 3V. If VIN is not present and one of the battery cells is less than this threshold during the time period specified by UPS_VBAT_UVP_OFF_TOUT parameter the UPS will initiate shut down procedure. If VIN is not present and one of the battery cells is less than this threshold the UPS will instantly shut down to preserve battery. During this period battery cells are checked against UPS_VCELL_MIN_STOP. If cell voltage exceeds UPS_VCELL_MIN_STOP the timer is rearmed so it can filter unwanted noise in the system. After UPS_VBAT_UVP_OFF_TOUT passed motherboard is signaled to shut down. The UPS will wait this period so that the Motherboard can shut down gracefully, than cut power and enter deep sleep. This period should not be too long to prevent battery drain. Deep sleep timeout..If system is running on battery and this period has elapsed with no input power applied, then the UPS will initiate shut down procedure. "Never" is allowed as value (to disable this feature). Max allowed discharge current. In case discharge current exceeds this threshold shutdown will be initiated. Conditioning/Pre-charge voltage. Charge current is limited until cell voltage exceeds this value and for at least CHG_TCOND time . Conditioning/Precharge time. Charge current is limited until cell voltage exceeds CHG_VCOND value and it is applied during this time. Maximum allowed bulk charge voltage/cell during constant current/constant voltage charging. An over-voltage value (CHG_BULK_STOP_VOLTAGE+CHG_HYSTERESIS ) that it is allowed when charging. If one of the cells exceeds this value charging is immediately stopped. If cell voltage is below this value charging can be started. For Lithium based batteries after an overvoltage condition is detected for a cell a resting period is set by this timer before applying a small topping charge in case other cells are still not charged. The battery chemistry to be charged. COLD temperature treshold for temperature compensated charge current regulation. COOL temperature treshold for temperature compensated charge current regulation. 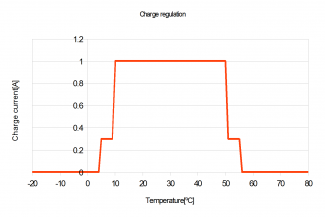 WARM temperature treshold for temperature compensated charge current regulation. HOT temperature treshold for temperature compensated charge current regulation. Balancing is allowed if cell voltages are above this value. If the voltage difference between cells exceeds this value start balancing the cells. If the voltage difference between cells is less than this value stop balancing the cells. The output voltage. Bit0 in UPS_CONFIG parameter should be set to “1” in order this parameter has effect. Offset for adaptive output regulation. Open Circuit Voltage State Of Charge detection for initial 0% fuel gauge estimation. Open Circuit Voltage State Of Charge detection for initial 10% fuel gauge estimation. Open Circuit Voltage State Of Charge detection for initial 25% fuel gauge estimation. Open Circuit Voltage State Of Charge detection for initial 50% fuel gauge estimation. Open Circuit Voltage State Of Charge detection for initial 75% fuel gauge estimation. Open Circuit Voltage State Of Charge detection for initial 100% fuel gauge estimation. AFE Overload Voltage treshold configuration register. AFE Overload Delay time configuration register. AFE Short Circuit In Charge configuration register. AFE Short Circuit In Discharge configuration register. Number of times the flash memory has been written. Parameter is Read only. a.) "HID UPS Battery" for OS built-in communication. Microsoft Windows versions are recognizing this class automatically and the device should appear in device manager at Batteries as a "Hid ups battery", together with all settings and power plan possibilities provided by the OS for any battery. The configuration software provides interface for OpenUPS2 monitoring, logging and setup. It's recommended to be used by users with deeper understanding of the OpenUPS2 hardware since permits setting voltages, currents and other parameters which can be dangerous if they are set without precaution. The title bar shows the connection status and the firmware version of the OpenUPS2. Example: "OpenUPS2 Connected v1.0"
The upper one is the Mini-box.com logo and it does not changes. The "Status" screen contains extended information about the current state of the OpenUPS2 like battery voltages, charge/discharge currents, temperature/voltage of the batteries and different states. The user also have the possibility to log the current state into a *.csv file. The "Extended state" flags are for debug/support and can change between different firmware versions. 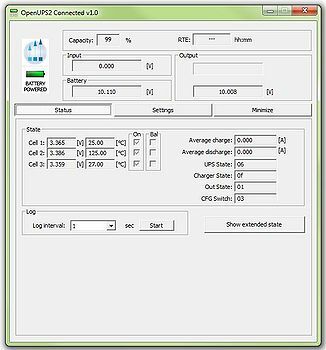 IMPORTANT: any parameter setting or battery wizard data is taken into account by the OpenUPS2 only after a full restart either with power cut from all sources (usb, battery, vin), either by the "Restart OpenUPS (full restart and reload parameters)" button. Do this with precaution, check the parameters and wires before doing it! - select the desired parameter from the "Parameters" drop down menu. The current value is displayed in the "Value" field together with the unit ([V], [mA] etc.). result of the check is correct, the resulting value is shown in the "Change log" field, otherwise error message might be popped up and the parameters selector jumps back to the wrong value. - after You have done with all parameter setting press the "Sync all parameters to the OpenUPS" button to send all values to the OpenUPS2. IMPORTANT: without this step the new values will be lost, nothing is sent to the OpenUPS2! 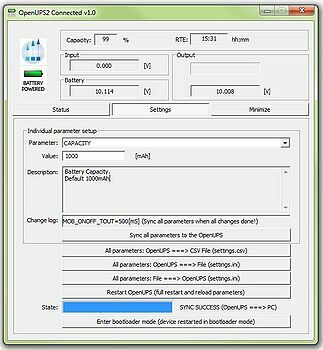 For users who need to setup more devices with the same OpenUPS2 settings, it is recommended to use the save/load parameters buttons. The "All parameters: OpenUPS ===> File (settings.ini)" button loads a full configuration from the OpenUPS and saves it to the settings.ini file. You can disconnect the current OpenUPS2 from the USB and insert a new one, than press the "All parameters: File ===> OpenUPS (settings.ini)" button to send the last saved configuration into the new OpenUPS2. The "All parameters: OpenUPS ===> CSV File (settings.csv)" button loads all parameters from the connected OpenUPS2 and saves it into a csv file. This type of file can be opened by any spreadsheet editor (OpenOffice, Microsoft Excel etc.) and contains the full set of parameters in human readable form. Every save/load/sync operation on the "Settings" screen affects the progress bar and the status bar on the bottom of the screen (labelled with "State:"). In rare cases You might get error here with "try again" message. This happens in case of one parameter byte get's corrupted or timeout occurs during USB communication and/or OpenUPS flashing operation. Please try again and contact our support team only if the device gives this error 4-5 times in a row. 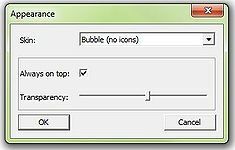 The popup window can be moved anywhere on the screen and can be customised. Our current setup has two skins but any combination is possible playing with the "skin*.mbs" files installed together with this application. The current skin can be selected right clicking on the try icon. The "skin*.mbs" files are simple text ones editable with any text editor (notepad for example). Adding a new skin is pretty simple – make a skin2.mbs (use the existing skin0.mbs or skin1.mbs for starting content) and start playing with the values from the new file. Mini-box.com provides one OpenUPS2 API in a DLL (OpenUPS2Lib.dll) and examples in Visual C++, Visual Basic and Visual C#. Basic C++/Visual Basic/C# knowledge is needed to use this examples together with the API. The API dll has manifest embedded to permit C# and Visual Basic dynamic load, external manifest is also provided in case if it is needed. IMPORTANT: the API supports only one OpenUPS2 connected to the computer. Open CLibTest.sln from the package, run it and see CLibTest.cpp for usage example. Open VBLibTest.sln from the package, run it and see Module1.vb for usage example. Open CSLibTest.sln from the package, run it and see Program.cs for usage example. This page was last modified on 10 October 2017, at 23:01. This page has been accessed 547,129 times.